Blooming tea, flowering tea, and art-tea are names for Chinese teas called Gong Yi Hua Cha. Translated, the name means “art flower tea.” The teas are crafted with edible flowers and hand-tied in a ball of tea leaves. While they steep in hot water, the ball opens and “blooms.” You can enjoy multiple infusions by adding more water to refresh the leaves. Thinsulate insulated Asian Floral Kup Kap on glass mug to hold in heat. Winnie Yu, owner of Teance Fine Teas, remembered these Chinese hand-tied teas to create FreeLeaf, a blooming tea on a string. FreeLeaf combines the full-bodied taste of loose tea and the convenience of a tea bag. In the mug, White Tea Jasmine opens to reveal a red clover flower center. Other FreeLeaf teas bloom with whole red carnations and rosebuds. Place a Kup Kap (cup lid) on your mug to hold in the heat at least 30 minutes! Thinsulate insulated Kountry Teapots Tea Tabard on a teapot; Thinsulate insulated Rosebud Rhapsody Kup Kap on a glass mug. To keep your water hotter, longer, put a Tea Tabard (tea cozy) insulated with Thinsulate Insulation over your teapot. Use the cosy as a hotpad to protect your hand from the hot teapot handle. Lift the front of the cosy with your other hand to pour hot water into your mug for more infusions. 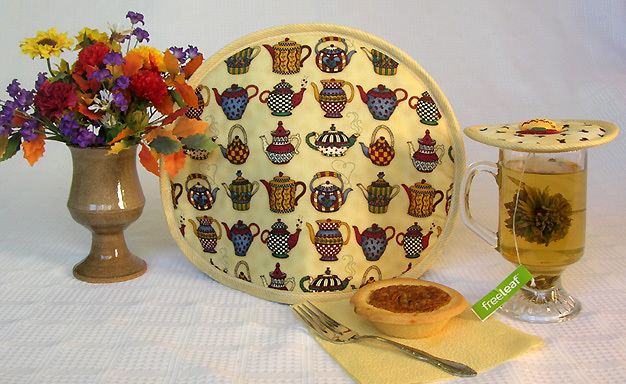 Stop by Boonzaaijer's Cakes & Pastries in Colorado Springs for a pecan pie pastry to enjoy with your FreeLeaf blooming tea!